We woke up to below freezing temperatures at our site in Congaree National Park, and instead of shivering around our stove waiting for coffee to percolate we hopped in the car and stopped at the first Waffle House we passed by. Being that we were in South Carolina, it didn’t take too long before we found one and we were soon enjoying hot coffee and breakfast. 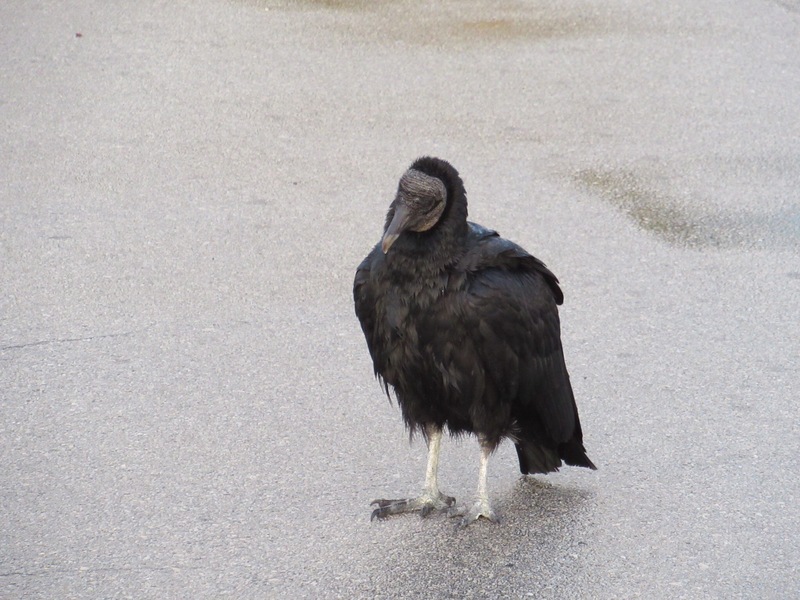 We ate quickly, and got back on the road for our long drive down to Everglades National Park. 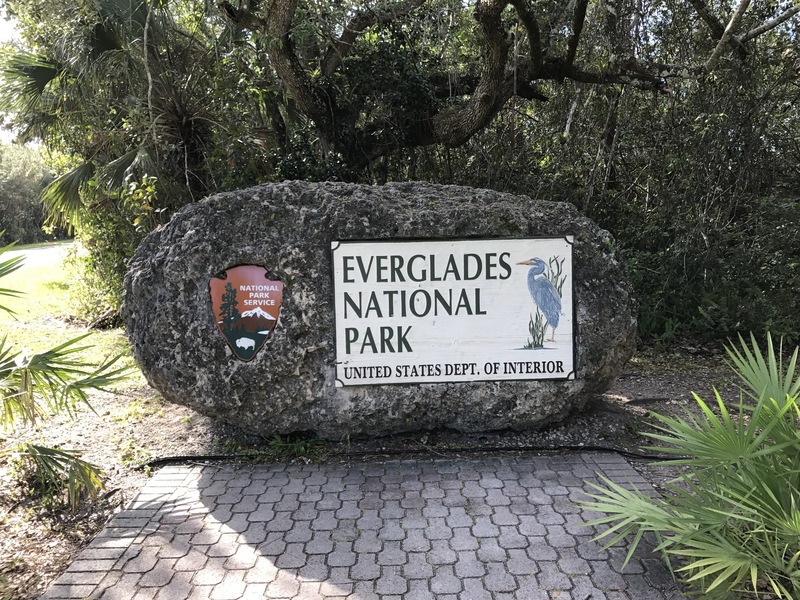 Everglades has a northwest enterance on the Gulf Coast, and a southeast enterance about 15 miles from the Atlantic. We decided to focus our visit on the southern side of the park (there are no roads connecting the two sides in the park; if you wanted to visit both, you’d have to exit one side and drive nearly 2.5hrs to the other). We drove about 12 hours to get to Homestead, the closest town to the park, and decided to stop there for a late dinner before driving another hour to get to the Flamingo Campground in the park. We tried a local Italian place, and sat at the bar hoping for a quick meal and to be on our way. The waitress made light conversation with us and asked why we were in town. We explained we were driving into the Everglades to camp for the evening. Her eyes grew huge and she asked incredulously what we were staying in. “A tent…” I said trailing off, confused by her reaction. She then launched into a lecture about how bad the mosquitos were. I politely told her we were outdoors people and we’d be fine; to which she rolled her eyes and told us again that we had no idea how bad they would be. We both were thinking that after the Sierras this summer, they couldn’t get much worse; plus, this is supposed to be the less buggy season in the park. She then interrogated us about our plans in the park, and we informed her that we’d be canoeing. Her eyes got wide again, and then warned us not to go swimming. I thought she was going to warn us about the dangers of alligators and crocodiles, but she surprised me by saying it was the bull sharks we had to be cautious of. This actually did alarm me a bit, alligators I was prepared for; but sharks? And this was all before we even ordered dinner. By the time we left the restaurant and continued our drive into the park, it wasn’t until 10pm that we pulled into the campsite. I hopped out of the car and enjoyed a few blissful moments of cool ocean breeze. “Garrett, there are NO mosquitoes!” I whispered gleefully. No sooner did I finish my sentence that the mosquitos began to swarm around my bare calves. I had a decision to make; take the time to find my pants in our packed car, or quickly set-up the tent in my shorts. I decided it would be faster to set up the tent, but by the time we were finished I easily had 50 angry welts up and down my legs. Lesson learned, the Everglades mosquitoes are the worst I’ve ever experienced. I now believed our waitress, but hoped her shark warning wouldn’t ring true, too. The mosquitoes thankfully weren’t quite as bad the next morning, plus we were prepared for them now, and we quickly broke down camp to get to the rangers station to get the proper backcountry camping permits. The station opened at 8am, and we had a rough idea as to where we would like to stay. 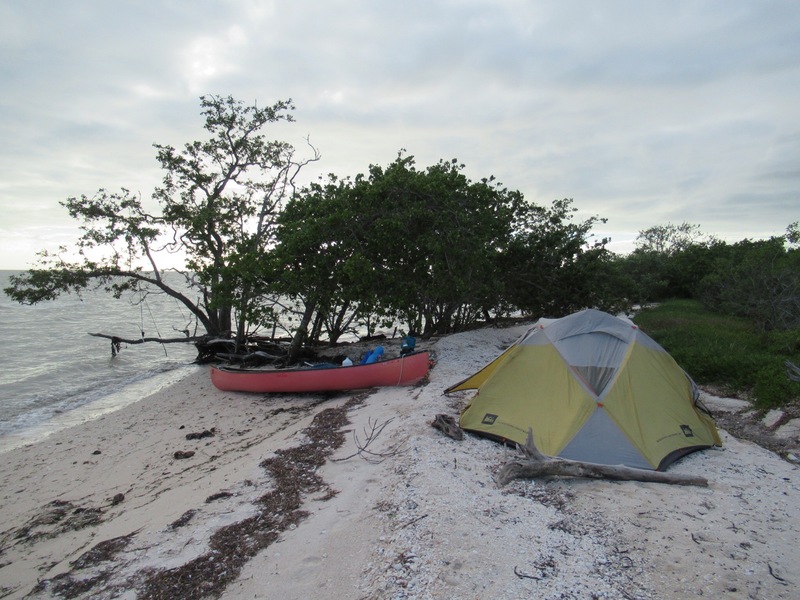 The Everglades has a wide variety of beach, ground, and platform (called chickees) canoe-in sites. The park reccomends planning about 8-12 miles a day, so we had hoped to link together a 2-3 night trip on camping on chickees in the mangroves. Neither of us wanted to paddle on the open water (and now I was worried about sharks! ), but after consulting the rangers, tide charts, site availability, and winds we somehow came out of the station with a whole different plan. 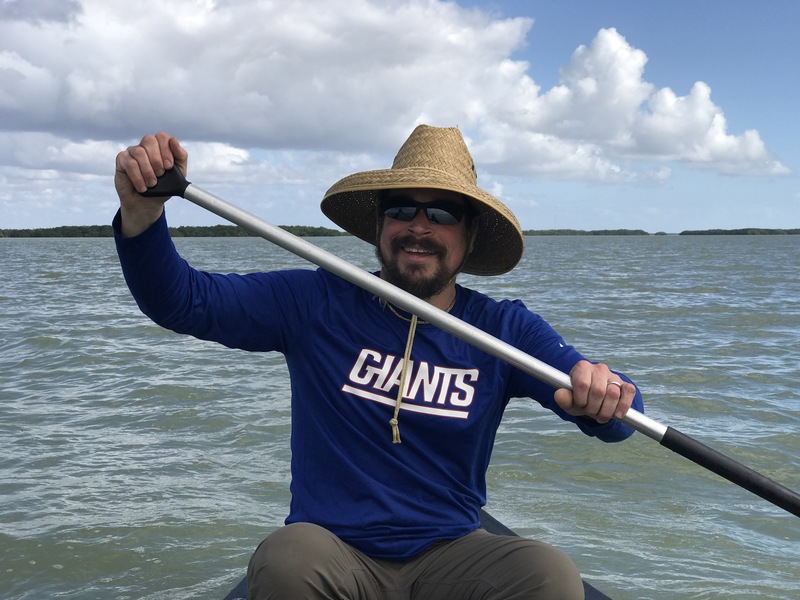 Instead, we were to paddle about 11 miles hugging the coast in Florida Bay (i.e. 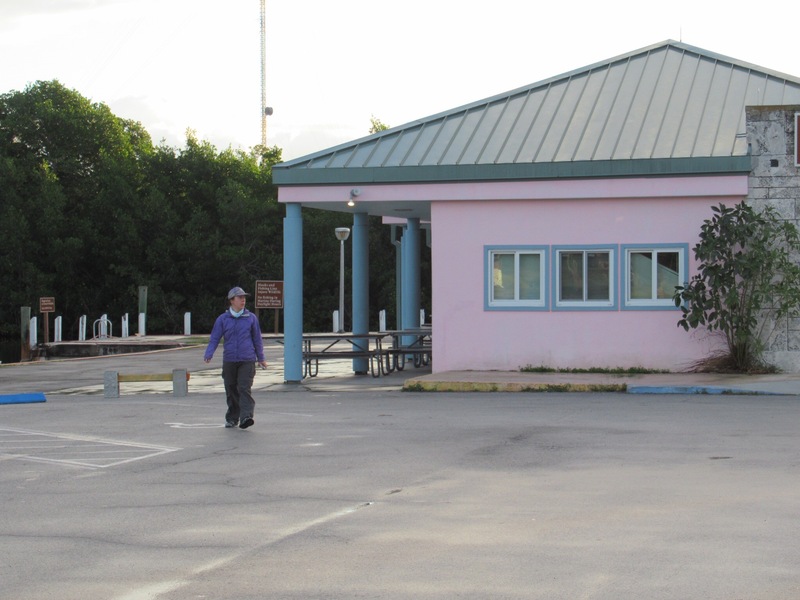 open water) to make camp at East Cape, a beach site pretty much at the southernmost point of mainland Florida. We’d spend two nights there, and then return the way we came. On the middle day we’d explore the mangroves through a channel not to far from our site. I was a bit dissapointed not to sleep on a chickee in the mangroves, but the rangers assured us that our beach site would be more comfortable as there would be less mosquitoes (a trade-off I was more than happy to take). We rented a canoe at the nearby marina, loaded it for camp, and were on our way by 10am. At first the paddling went well. 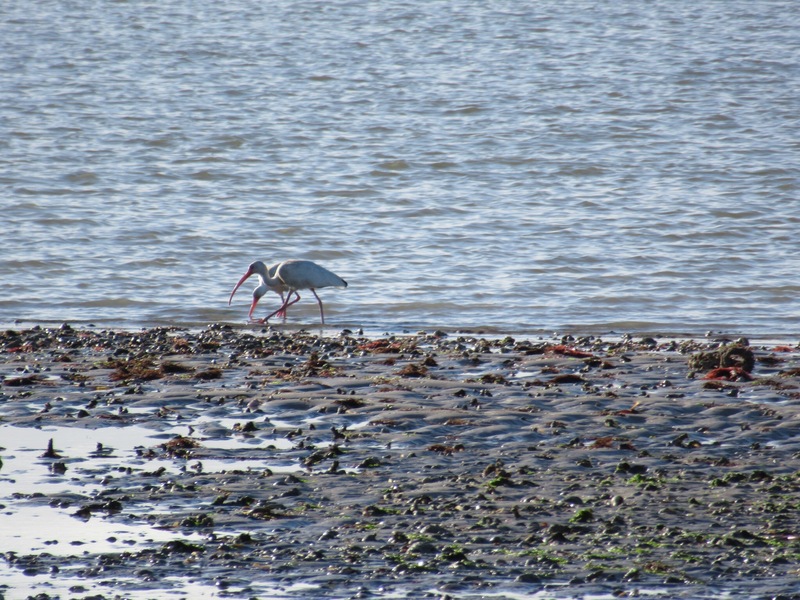 The water was calm, and we paused to take pictures of birds and the surrounding scenery. We saw dolphins splashing in the distance, and were moving along at a good clip. About two hours in, the wind started to pick-up and the water became a bit rough. To our dismay, judging by the coastline it seemed like we were going nowhere, and it became a struggle to keep the boat straight. We fought through it, and gratefully landed on our beach about 230pm. We ate lunch, and then poked around for a campsite. I consulted our GPS, and realized we’d landed just east of the cape. Feeling energized, we got in the canoe once more to paddle the last mile. The wind had died down, and we had an easy paddle. We setup camp, feeling quiet accomplished, and started dinner. The sun set as we were finishing eating, and contemplating if we wanted to eat more food. Our decision was quickly made for us, as the mosquitoes and noseeums came out enmasse. We scrambled into the safety of our tent, played some cards to pass the time, then fell asleep early- tired from all the paddling! So glad you are back on the road. We take great delight in your adventures and we just have to get through the next couple of months of winter. Love the sweatshirt Garrett. Maybe next year. Thanks! In the absence of the Giants in the playoffs, I’ve recruited him to root for my hometeam (the Steelers!). Wow, more adventures! I guess the West Coast energized you both. Thanks for sharing this part of your journey. And do let us know if you run into sharks! PS Cafe is closed again, chief cook’s family complaining they were out of the house too much. Sure you don’t want to hop a plane and reduce us poor hungry Harpswell folks? Vegan pancakes, I dream of them……. Give our best to Chris, too!